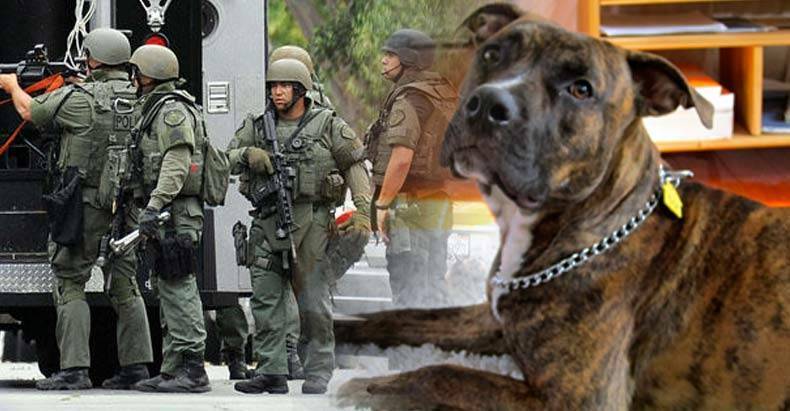 St. Louis, MO — Nothing says Police State USA quite like a SWAT team raiding a family home and killing their dog because they are unable to pay their natural gas bill. The woman whose dog was killed and home destroyed by SWAT officers is Angela Zorich, and her story about her police state experience will shock the conscious. “This is an example of police overreaching and using excessive force to get a family out of their house,” said Kenneth Chackes to the Riverfront Times, the attorney who represents Zorich. According to the lawsuit, on April 25, 2014, St. Louis County Police officers came to her house. Her son cussed at them. They inspected the home’s exterior and placed a “Problem Properties” sticker on the front window. Days after being publicly shamed and labeled by the St. Louis Police Department as a “Problem,” on April 28, Zorich called them to follow up. She was told by police that she was being investigated for failing to have natural gas or electric service; two violations against city code. Zorich admitted to the police that she did not have gas, but said that she did have electricity. Zorich asked for another inspection to prove that she had the utilities. The officer told her that was fine, but that the investigation would continue. The next day, on April 29, 2014, the home of Angela Zorich was raided by multiple officers from the St. Louis County Police Tactical Response Unit. Zorich was subsequently taken into custody at the police station. When she was finally let go and allowed to return to her home, she found to be completely trashed. Beds had been overturned, and items that were once on shelves had been thrown to the floor. The citations issued to Zorich, which had allegedly justified the heavily militarized raid on her home, were for substandard siding, guard rail, screens, window glass and deck. A dozen armed men dressed for war, were dispatched to a woman’s home, killed her dog, and kidnapped her because of some moldy wood and her inability to pay her gas bill. In what world is this considered “justice”? The apologists will say that Angela Zorich provoked police into this action against her. If she didn’t want to be raided, they will say, she should have just paid her gas bill. The thought of the raid being retaliatory in nature won’t enter their minds. Named in the lawsuit is the county of St. Louis and two officers, Corey Zavorka and Robert M. Rinck. Her allegations include unlawful seizure and unlawful infliction of emotional distress (for the killing of the dog) and unlawful retaliation. Hopefully, with her legal team, Zorich gets the actual justice she deserves.